It’s one of the first things you see when you get to Köln. For me, arriving at night, you could spot it from halfway across the city – perhaps further. Gorgeously back lit, Koeln Cathedral sticks out like a sore thumb, albeit far prettier than a thumb. You might choose to call it the major attraction in Cologne. Don’t get me wrong, there are plenty of other wonderous sights to behold, but Köln Dom (assuming I haven’t butchered that) is definitely one of the best.You can spot it from a mile off, but when you actually approach it it begins to disappear behind the various nearby buildings. All before opening up around the cathedral itself, at which point it finally sinks in just how massive it is. I, for one, never had the slightest clue how huge it was until I was stood at the foot of it feeling like an ant. You might say it helps to put a lot of things into perspective.If you find that difficult, just compare the size of the people in this photo (who aren’t standing against the walls) to the height of the building – and then also consider that I physically couldn’t get back far enough to fit the tower and spire into my picture. That alone speaks volumes. You can’t see (or hear) the organ in these pictures – and suddenly you have a reason to be there!After a slow stroll around the cathedral, and dodging all of the people that you can see in the photo above, it was almost time to leave and continue the sightseeing tour of Koeln. 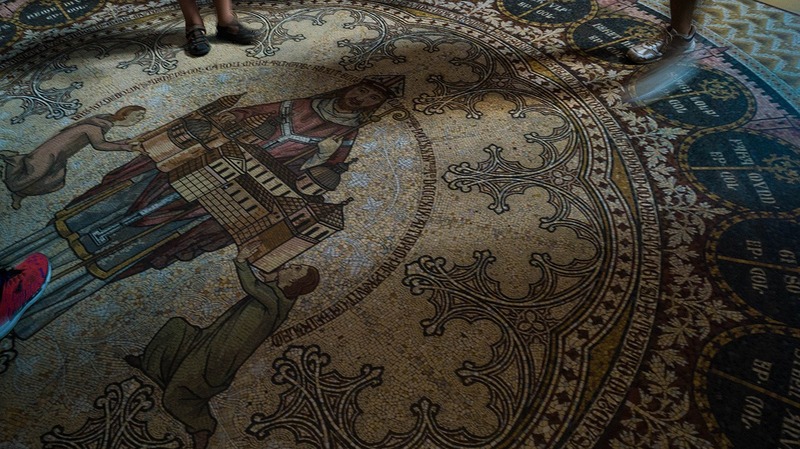 This is when we were about to enter the back section of the cathedral – I saw some pretty neat floor art, if that’s what you want to call it, so I wanted to take a look.Oddly, I found that the cathedral was being cleared out, which is quite lucky because otherwise I’d never have managed to grab a snap of the mosaic masterpiece that had hundreds of people walking across it just moments before. I daren’t think how long it took to put that together. How do people even tile mosaics? Imagine putting one of the pieces wrong and only realising after you’ve laid another few thousand parts. Gutted would be an understatement.Back to the cathedral clearing out.It turns out it was around 11:45 am at this point, and they were preparing for a midday prayer. That meant if you didn’t want to be there, remove yourself from the cathedral, and also that there would be no picture taking or recording for the next 45 minutes. 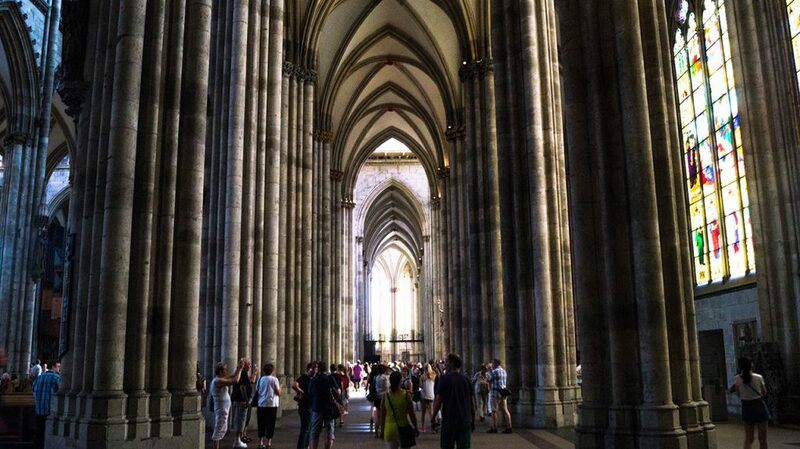 Pretty smart rules if you ask me.I’m such an opportunist.How often do you find yourself in one of the largest Gothic cathedrals in the world, right as it’s time to pray? You don’t, really. To Nicola’s dismay I decided to stick around and see how it was – after all, these experiences don’t come very often, so you have to take them whenever they do.This is the best that I found best.The prayers are in a bunch of different languages. That’s pretty cool if you ask me. The hard part is that it’s quite difficult to follow and you end up kind of joining in whenever you find the right section. It’s an unusual sight seeing so many people from around the world meeting in a massive church and going through prayers in their own languages, but a great one nonetheless.When you’re sitting there, relatively comfortable, you can also get a grasp of how amazing the windows are. Inside a dark building, the different colours really do shine through. Again, please excuse the grainy picture. And the organ? It sends shivers down your spine. 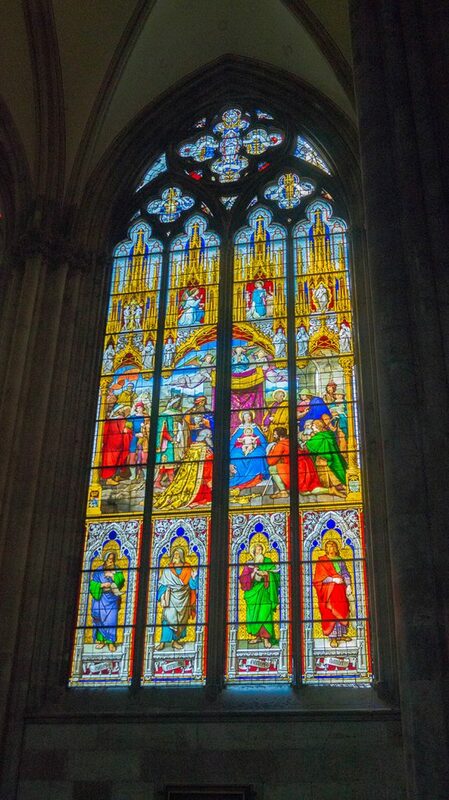 If nothing else, it’s worth staying to hear it in the flesh.Such was my trip to Koeln Cathedral. 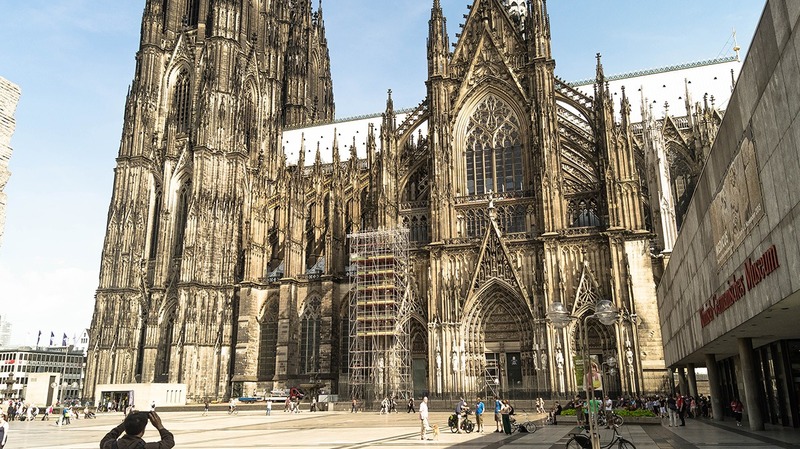 If you ever find yourself staying in Cologne, or simply passing through on a whim, I highly recommend you take the time to stop by the Dom and see it for yourself. You certainly won’t be disappointed.